Evenly distribute dressing throughout your salad with the 5 gallon plastic salad spinner / dryer with brake! Whenever salad is served, the highest cost item is the dressing! 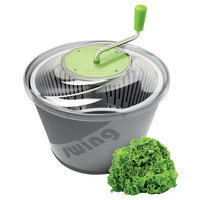 By using one of our commercial salad spinners, dressing "clings" to the lettuce. This not only cuts down on the amount of dressing used but also makes for better presentation. 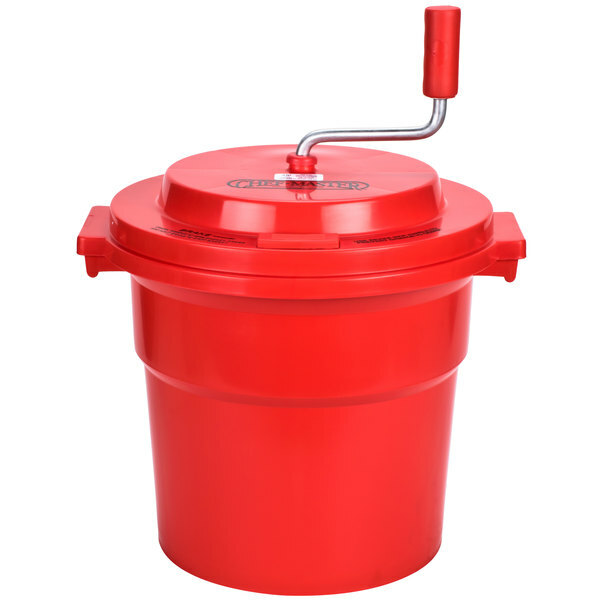 With this 5 gallon plastic salad spinner / dryer with brake preparing salads for your dinner rush will be easier than ever before. "This salad spinner fits 3 heads of lettuce easily! It dries the lettuce to perfection in no time! We bought a similar salad spinner from another site but it just could not get the lettuce as dry as we needed. I am so happy we bought this spinner. Money well spent!" This 5 gallon lettuce spinner incorporates a patented brake system. While using a lettuce dryer, it is typical for the user to force the spinning handle to a quick stop. While this practice does save some time, it is also very stressful to the gear system in the salad dryer. 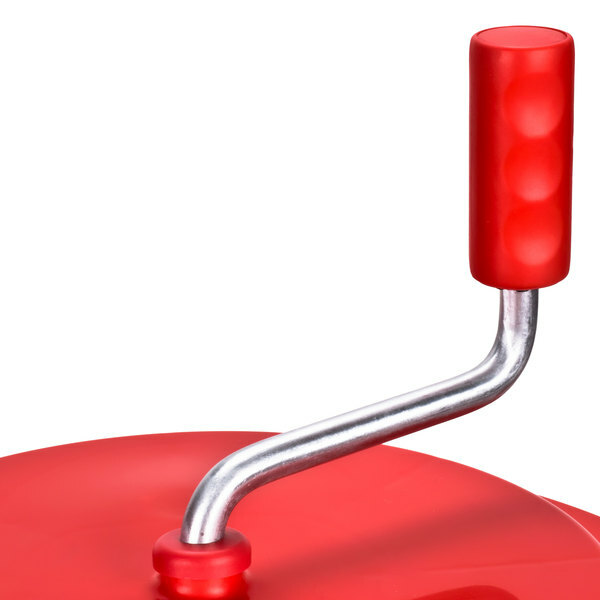 Now you can simply press the large, rectangular button right on top to quickly and easily bring the spinner to a stop. The heavy-duty plastic construction with no assembly required accommodates 5-6 heads of lettuce, making it a must-have for restaurant use. 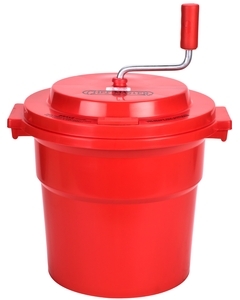 Plus, this spinner includes a sealed gearbox for more sanitary conditions. The rust-resistant crank grip handle has finger grips to minimize operator fatigue and is made of tough, corrosion resistant chrome plated brass. The handle may spin clockwise or counter clockwise. 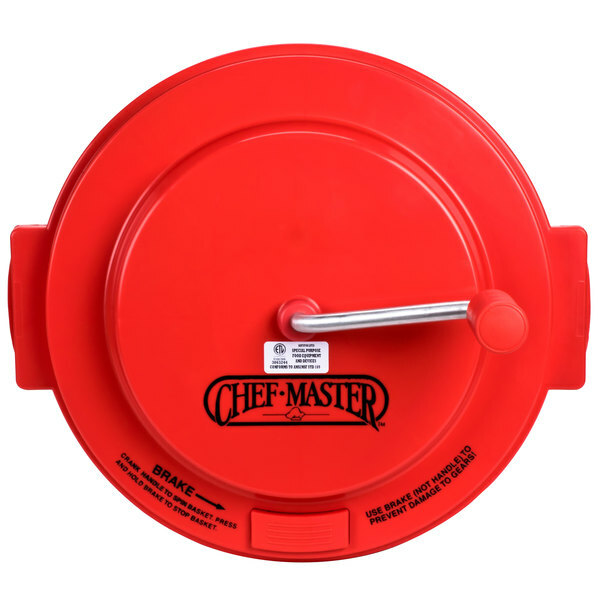 This commercial salad spinner is equipped with convenient side handles for quick and safe transportation from the storage area to the prep station and then to your dishwashing area. What is the purpose of a salad spinner? 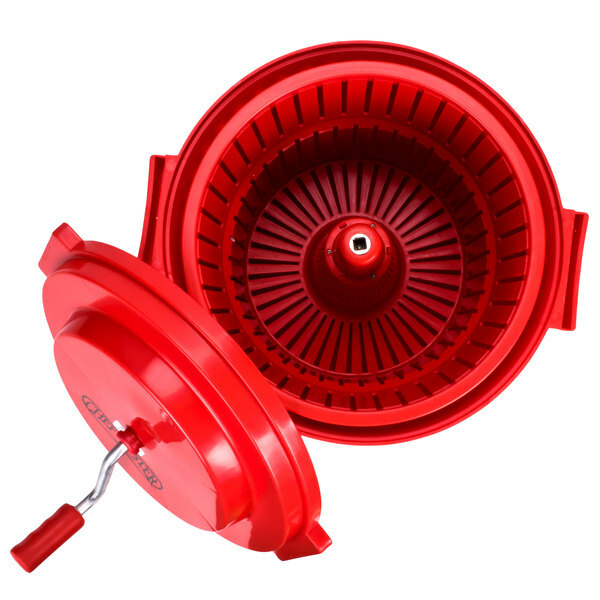 Salad spinners are meant to remove excess water from lettuce left behind from washing. Spinners remove extra moisture to prevent your lettuce from becoming soggy, but they do not leave lettuce bone dry. After spinning, lettuce should be transferred to a perforated pan, and left to finishing draining in the refrigerator. Covered by a 6 month manufacturer’s warranty against defects. As a CSA farmer I handle a LOT of salad greens and removing excess water after hydrocooling/washing greens is really challenging. This spinner is perfect for our mid-size vegetable farm. We use it for all of our salad mixes and braising mixes. It is not big enough or gentle enough to manage whole heads of lettuce, but it is quick and easy for loose leaf mixes. An added bonus: we are currently in the process of becoming GAP certified (a farm food safety certification that makes it easier for small farmers to work with local schools, hospitals, etc.) and the GAP auditors pay very close attention to greens handling, as greens are a particularly high risk crop in terms of food born illness. 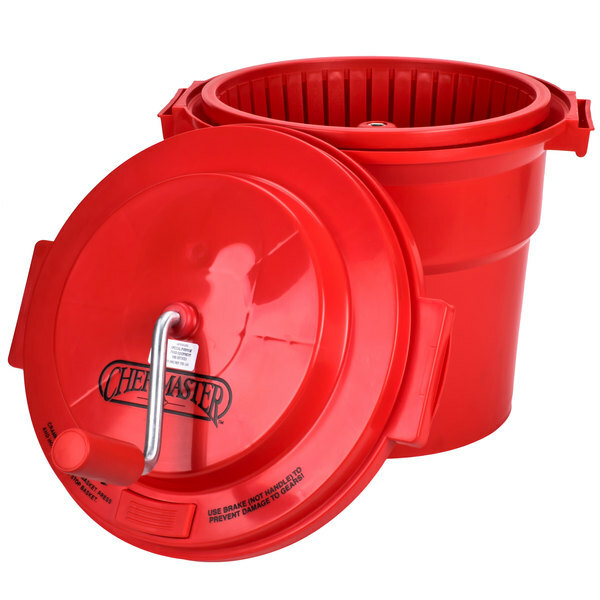 This spinner is easy to sanitize and (obviously) intended for food handling, unlike the make shift modified washing machines and/or mesh bags a lot of small farms use for greens. I had about 7 years of daily use out of this before it went bad. Think I got my moneys worth. Definitely recommend and can put enough salad in there to make at least ten entree salads. A necessity in any kitchen serving large quantities of salads, something we do daily. We use this every day and have never had an issue with the brakes or any part of it. This thing is great, you can fit a ton of greens in it at once. It saves a ton of time getting rinsed lettuce dry and is made really well. Who wants a salad that tastes like water. Holds a lot of lettuce at once, and lets you spin it easily. We have had good luck with these. As our small sandwich shop has grown, we find our lunch crowd constantly expanding. The amount of lettuce we go through in a day has become ridiculous, and this spinner has been a miracle for us! 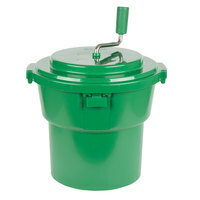 Holds a ton of lettuce(or other fresh produce), really easy to operate, and cleaning is a quick and painless process. 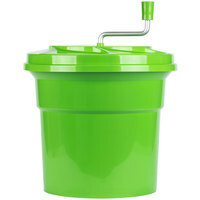 if you need to wash greens in large quantities, this giant salad spinner can't be beat. it's a pretty standard fixture in most big volume kitchens and with good reason. it's very sturdy and reliable. giant salad spinner will hold enough greens for one hundred salads. 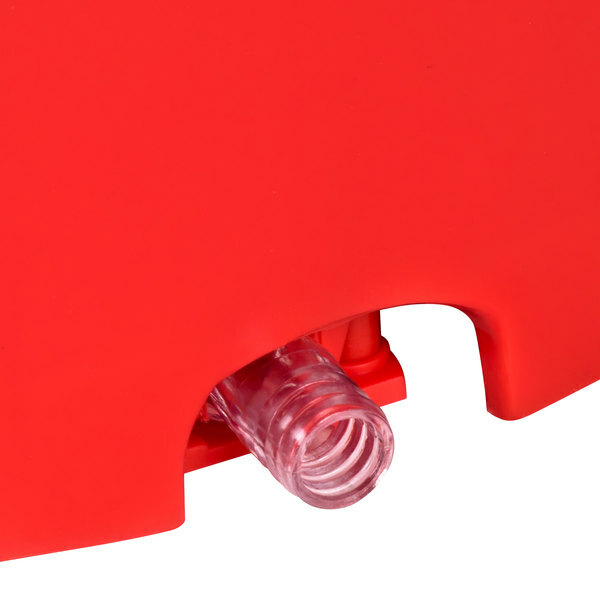 The drain tube is long enough to rest it on a table next to a sink even if you don't have a large drainboard. Top of the line salad dryer. The brake is so very useful. And you can fit a very large amount of produce in it with ease. This salad spinner fits 3 heads of lettuce easily! It dries the lettuce to perfection in no time! We bought a similar salad spinner from another site but it just could not get the lettuce as dry as we needed. I am so happy we bought this spinner. Money well spent! This is a workhorse for processing high volumes of greens. I looked at other models elsewhere that were 4x the cost - don't waste your money. I have used mine for 3 years and it is still going strong. 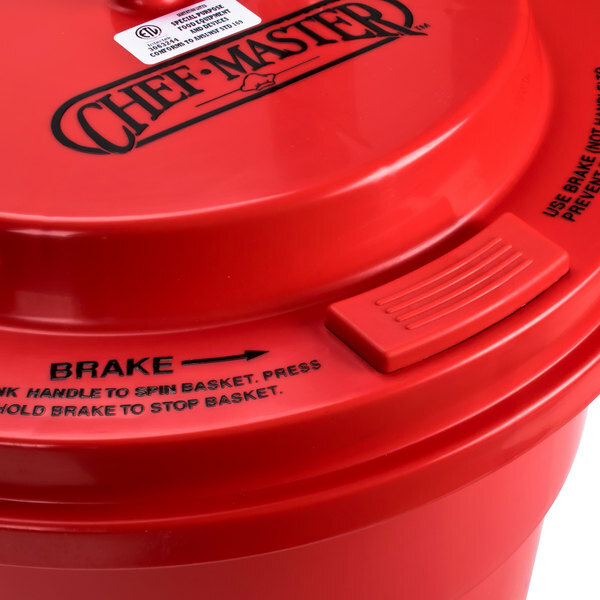 You could easily fit 5 + pre-washed collard bags in the 5 Gallon Plastic Salad Spinner / Dryer with Brake. It's so nice to do big batches so you can cook in bulk. Great Item! We have used this spinner for years and it finally broke. We Reordered the exact same item because we liked it so much! I REALLY RECOMMEND YOU THIS DRYER, I USE IT FOR DRY LETTUCE. 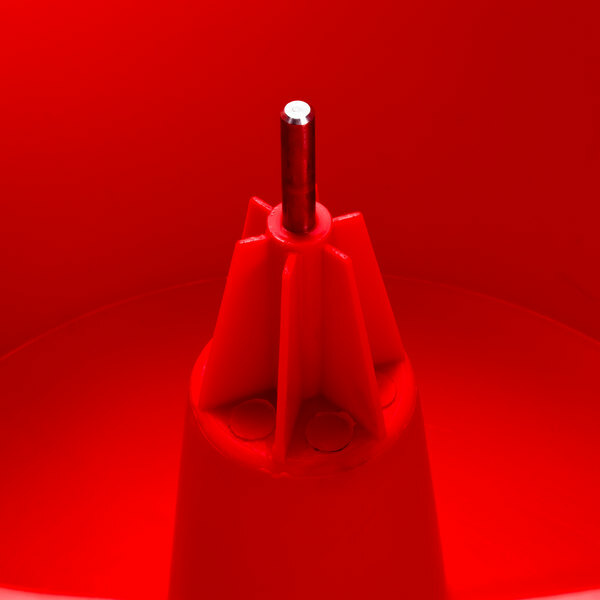 THE PLASTIC THAT ITS MADE IS VERY RESISTANT AND HYGIENIC. IF YOU HAVE THE OPPORTUNITY BUY IT. 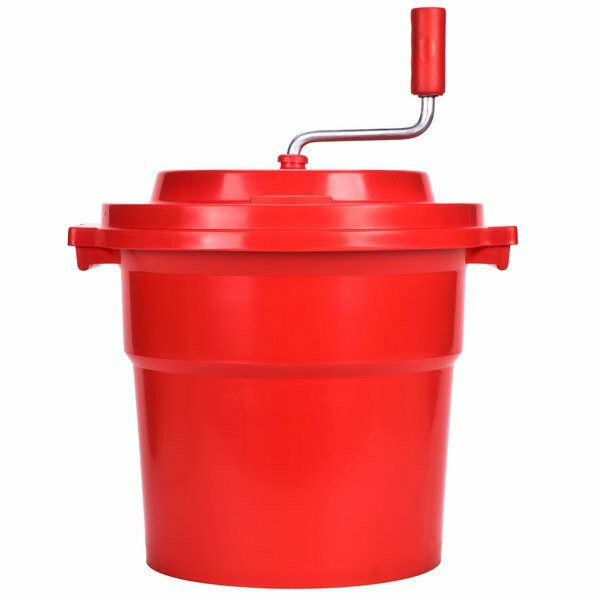 This is a high quality salad spinner. I wish the price was a little lower but it makes quick work when rinsing off romaine lettuce crowns for our sandwich station. It seems a little bit expensive for what you get, and doesn't do a perfect job of eliminating water, but if you're intent on fresh chopped romaine or fresh herbs, this tool is a must.